Encore Notation is a music writing software application that lets you create, play back and print beautiful sheet music easily. Since more than 20 years Encore Notation from Passport Music Software is one of the leading music notation programs – easy to use – powerfull and reliable. Encore is a very intuitive music writing and composition software what instantly turns your songs and arrangements into perfect looking sheet music. Editing and printing musical notation was never easier. 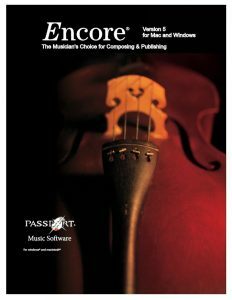 Latest News: If you already have another notation software (such as MusicTime, Allegro, Vivaldi, Mozart, Maestro, Midi-Connections Score, Sibelius, Dorico, Magic Score, Notation Composer, Forte, Notensatz-Genie …) you can purchase Encore for a reduced price of only € 89.-! Note: All old files from all previous versions of MusicTime, DataBecker Notensatz-Genie and – of course – all old Encore files can be opened and edited in the new version of Encore Notation!